Please refer to our stock # 3429 when inquiring. 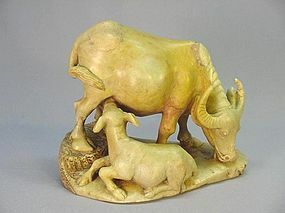 This early 20th century large stone carving of a water buffalo cow and calf is 6 ½” high, 7 ¾” long and 4 ½” wide. It depicts a cow eating grass but feeding her youngster at the same time. The bodies of both calf and cow are finely incised to represent hair. It is in excellent condition.